Park View Townhome Rental in Park City Utah. Book Today! 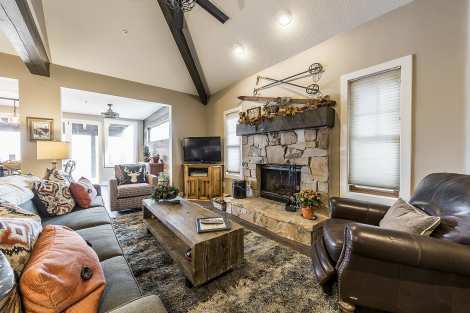 Nestled in the trees and privacy of Park Meadows with sensational mountain and ski slope views of Park City Mountain Resort, this multi-level luxury townhome has the latest in fashionable finishes and mountain contemporary furnishings . Completely remodeled in 2016, it blends both fashion and function into an eclectic warm environment with clean lines and open air living space. Opening out onto a massive deck and gorgeous meadow views from the hot tub grill and outdoor dining space, guests will also enjoy the exterior entertaining space just the same. With a mix of mountain timber industrial elements and indigenous stone and glasswork in the bathrooms, this property is sure to impress. The luxury abode offers two king master suites in the upstairs level and a suite with two twins . The lower level offers secondary living space, a full bath and bedroom suite with 4 twins in a double bunk bed configuration. Complete with multiple fireplaces throughout, sleeper sofa in the lower level, multiple flat screen tvs and dvd players, a laundry room and a 2 car garage, this property offers every creature comfort for families and executive groups alike. An easy access location , whether you choose to walk around town or take advantage of the free shuttle immediately accessible to the townhome, the sky’s the limit at Parkview. FANTASTIC HOME! We loved our stay - the home has so many amenities...stocked kitchen with basics like spices and baggies, laundry soaps, cleaning supplies, etc. A dream location and so beautifully decorated...like a model!! New everything...kitchen, bathrooms, furnishings and hot tub. We loved the location to the ski resorts and right on the bus route. Very easy to access all of Park City's attractions. We will definitely stay here again! Thanks so much! !